#MPBTurns4 - Win a £100 Mainline Menswear gift voucher! At the end of last year in the run up to Christmas, you may have read my gift guide post on Mainline Menswear where I wrote about some great present ideas from the site. If you missed it and aren't familiar with the company, they are the place to shop for designer brands specifically for men. They stock 85 different brands from Lacoste to Ralph Lauren, catering to all budgets and offering trends to suit every man. 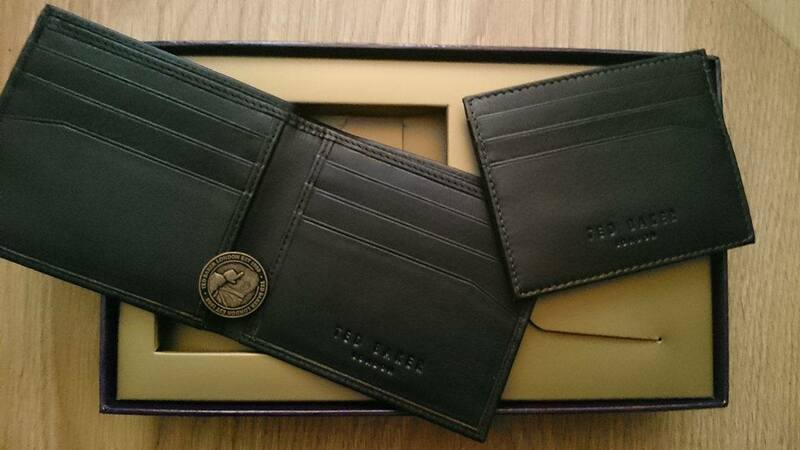 My partner Chris owns the Ted Baker wallet set above from Mainline Menswear. As part of my #MPBTurns4 blog birthday celebrations, Mainline Menswear have very generously offered my readers the chance to win a £100 voucher to spend online. All you have to do is fill in the Rafflecopter widget below. Good luck! 197 comments on "#MPBTurns4 - Win a £100 Mainline Menswear gift voucher!" I would buy my dad a nice polo shirt and trusers to play golf in. I would have a pair of Versace low profile trainers. I've spotted a lovely pair of black Converse hi-tops in the sale for me, then I'd spend the rest on my partner, he desperately needs a new a pair of jeans! I'd treat hubby to a new pair of trainers - he's in dire need of some. I think he'd like the ADIDAS ORIGINALS HAMBURG TRAINERS in NAVY. The Lacoste wallet in black. I would buy the NIKE STEFAN JANOSKI MAX TRAINERS BLACK, for my son, as he needs some new trainers. Thanks for running this lovely giveaway. I would buy a ralph lauren shirt for my younger brother, he is turning 18 this year so it would be a nice gift. Barbour Hooded Bedale Jacket Green would be loved by my husband. I would buy my partner Robert the lovely Lyle and Scott flannel shirt in grey! Very trendy. would buy some new shirts and a coat for husband's birthday coming up! I'd have to let him choose himself if I was lucky enough to win but I think he would go for new Levis and a Paul Smith shirt - two of his favourite brands. Rafflecopter entries are in my real name NIKKI HAYES, congratulations on your 4th blog anniversary! The Pretty Green Upton Bomber Jacket and Lyle and Scott jersey shirt would be great. 12 pairs of Ralph Lauren socks. My partner is in need of a new belt, socks and wallet. My partner would probably like one of the North Face jackets. It would be for my partner and I would spend it on some lovely t-shirts, the True Religion ones are nice, a new leather belt, and leather glove because his hands get cold and his bike! The Lyle and Scott grey flannel shirt for my OH. I would get my husband a pair of G star jeans and an Armani T shirt! I would love to treat my partner to some new trainers! I love the old skool Vans! a couple of new t-shirts or shirts for hubby who could do with a wardrobe refresh! I'd treat the hubby to the "Luke 1977 Drysville Hooded Jacket Navy" and a pair of "Gazelles"
I'd let my husband choose, but I'd be pushing for a pair of jeans and trousers or a shirt. It would be nice for him to update his wardrobe a bit. I'd buy some Hugo Boss t-shirts for my husband. They wash really well and don't fade. I would buy the BARBOUR INTERNATIONAL GREEN BOMBER JACKET NAVY. He would love it! I would buy some converse high tops for my son! I could use some new shirts to refresh my wardrobe. I like the look of some of the Levi and Henri Lloyd ones. I like these jeans http://www.mainlinemenswear.co.uk/product.php?xProd=77340 I think they will make my husband to be's bum look super cute! I would let my partner choose what he wanted. But if I was to choose myself, I would buy him a Barbour jacket. I would let my husband choose, but I think he would like some Nike trainers and some new jeans. My partner rotates black tees and jumpers so i'd love to get him some of the more colourful Hugo Boss tees! I would buy my husband some fantastic new jeans and a lovely pair of converse !!! Would love to win and buy my husband a nice Armani wallet. He never asks for anything and deserves a lovely gift! My husband needs some new work shirts. My other half would love the HUGO BOSS BLACK LOGO SWEATSHIRT BLUE and HUGO BOSS BLACK FULL ZIP HOODIE BLUE so would love to be able to get these for him! I would get my husband G Star Raw 3301 Slim Jeans Blue , he's in need of some jeans and it would be great to get him some really decent ones. I would let my fiance choose. I know he loves Hugo Boss so definitley something from that range. I would buy my son something smart to wear for his work experience. Definitely some new Levis for the hubby!! would buy the ARMANI JEANS V NECK LOGO T SHIRT BLACK, looks great. I would love to buy 2 hoodies for my husband if I were lucky enough to win. I'd buy FRED PERRY FUNNEL NECK BOMBER JACKET BLUE for my hubby. He's wanted that jacket for ages! I would love to get a nice belt for my husband. I would get the Adidas originals tubular radial pk white trainers. I would choose the Nike Air Pegasus 83 trainers in black. A couple of Levi's shirts; they're a great classic item. I would treat my husband to something lovely for our summer holidays! I think I would choose the gorgeous Ralph Lauren Navy Striped Polo! I'd like a new coat so I'd put it towards the Barbour Ariel Quilted Jacket In Olive Green! I would surprise my fiance Dean with some gorgeous Hugo Boss knitwear....he is a dapper chap!! I think I'd get a new pair of Levis for my husband or the teen! I'd get my husband the Hugo Boss black full zip sweatshirt in grey and the Hugo Boss black logo sweatshirt in blue - he really needs to replace his casual wear! I would love to treat my husband to this lovely top by Luke 1977, Maybe in Grey and White. I'd treat my 'Main' man to a pair of 'PRETTY GREEN GRESHAM WEAVE DESERT BOOTS GREY'!! Who is a bigger 'shoeaholic' then me! lol!! He loves anything by 'Pretty Green', and, these are 'heel'ly fab!! .. thanks Deborah Swain!!! I'd get Fred Perry long sleeved classic Oxford shirt. The North Face Base Camp Travel Bag Black and Under Armour Storm Hustle II Backpack Bag Red . A good pair of jeans for my man. I'd get my son some new converse trainers. The North Face Berkeley Backpack and 2 North Face T-shirts would be my choice. The Hugo boss sweatshirt would be what my husband would choose.